This article is about the person. For the talk show, see Ricki Lake (TV series). Lake was born in Hastings-on-Hudson, New York, to a secular Jewish family. Her parents are Jill (a homemaker) and Barry Lake (a pharmacist), though Lake was largely brought up by her paternal grandmother, Sylvia Lake, until Sylvia's death in 1978. Lake attended Ithaca College for one year. Lake made her film debut as Tracy Turnblad, the lead character in John Waters's 1988 cult classic Hairspray. Lake also starred in other Waters films including Cry-Baby (with Johnny Depp and Susan Tyrrell), Cecil B. Demented (with Melanie Griffith and Stephen Dorff), and Serial Mom (with Kathleen Turner and Sam Waterston). She starred in Mrs. Winterbourne with Shirley MacLaine and Brendan Fraser, Cabin Boy, Last Exit to Brooklyn, Cookie, and Inside Monkey Zetterland. She joined the cast of the Vietnam War drama series China Beach as a Red Cross volunteer, Holly "the Donut Dolly" Pelegrino, for the show's third season. She also had a recurring role on the CBS sitcom The King of Queens as Doug's sister Stephanie. She guest-starred on television series including Drop Dead Diva and a voice role on King of the Hill, and starred in the television movie Baby Cakes. She had a cameo appearance in the 2007 remake of the original cult-classic Hairspray as a William Morris talent agent, and teamed up with star Nikki Blonsky (who played Tracy Turnblad in the 2007 movie musical remake) and Marissa Jaret Winokur (who played Tracy Turnblad in the Broadway musical based on the original 1988 film) to record "Mama I'm a Big Girl Now" for the soundtrack. The song is played during the film's end credits. She later reunited with original Hairspray co-star Deborah Harry for the film Hotel Gramercy Park, which was released in 2008. 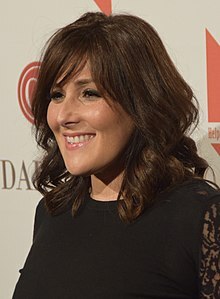 Ricki Lake was Lake's first daytime talk show and at 24, she was the youngest person at the time to host one (that record would later be broken by eight-year-old Philippine child actress Ryzza Mae Dizon in 2013). The show specialized in topics involving invited guests and incorporated questions and comments from a studio audience. The show debuted in syndication on September 13, 1993, and ended first-run episodes on May 25, 2004. In 2000, Lake told Rosie O'Donnell in an interview that she had signed on for four additional years. Although Sony Pictures Television had many stations contracted through the 2004–2005 season, Lake decided to end the show in August 2004, citing (among other things) a desire to spend time with her family. She moved from Los Angeles to New York to tape the 11th season of the show, then returned to California when taping was complete. Lake returned to the talk show platform when she hosted a second talk show which premiered in September 2012 and was cancelled after one season. After her talk show had wrapped production on its final season, Lake went on to host the 2006 CBS limited series Gameshow Marathon, which re-created classic game shows with celebrity contestants. She also signed a development deal with Gameshow Marathon production company FremantleMedia for other ventures, including creating and producing future programs and projects. In October 2007, Lake appeared in the Lifetime TV movie Matters of Life and Dating. Lake also had a cameo in the 2007 film Hairspray as a talent agent and also sang "Mama I'm A Big Girl Now" with Nikki Blonsky and Marissa Jaret Winokur for the film's end credits. The Business of Being Born, Lake's documentary about home birth and midwifery, was released in limited markets on January 18, 2008. The film premiered at the Tribeca Film Festival and Red Envelope released the film in New York, L.A. and San Francisco in October; it also screened in Australia. The Business of Being Born included footage and details of Lake's own "life-changing" home-birthing experience and followed a midwife going about her work. Tribeca called it "The Inconvenient Truth of Childbirth". Lake described it as her life's work for the last three years and expressed hopes that the film educated and empowered people to really know their choices in childbirth. She performed in the CBS television special Loving Leah in January of that year. Lake also jointly wrote a book on the world of natural childbirth and birthing options, along with Abby Epstein and Jacques Moritz, Your Best Birth, which was published by Wellness Central on May 1, 2009. Lake and Epstein also launched MyBestBirth.com, an online social network, powered by Ning, intended to allow parents and medical professionals to dialogue about varying birthing options and resources. Lake returned to television on May 11, 2009, succeeding Sharon Osbourne as host for the third season of VH1's Charm School. On November 10, 2010, Lake joined fellow talkers Phil Donahue, Sally Jessy Raphael, Geraldo Rivera, and Montel Williams as guests of Oprah Winfrey on The Oprah Winfrey Show, marking the first time those hosts appeared together on one show since their respective programs left the air. In March 2011, reports said that three television studios, Twentieth Television, Universal Media Studios and CBS Television Distribution, were interested in bringing Lake back to the talk-show realm in 2012. This after Lake began appearing on various programs in which she expressed a desire to return to the genre. Lake competed on the 13th season of Dancing with the Stars. She was partnered with three-time champion Derek Hough and cited Kirstie Alley's appearance as an inspiration to do the show. Lake achieved tremendous success, consistently achieving high scores. After making the finals, Lake was announced as the contestant in third place, losing to television personality Rob Kardashian and actor and Army veteran J. R. Martinez, despite having higher scores than either. On April 20, 2011, Lake signed with Twentieth Television to develop The Ricki Lake Show, which premiered in September 2012. The new program had a more Oprah-like format as compared to her earlier talk show. It was cancelled after one season. Lake won the Daytime Emmy for Outstanding Talk Show Host in 2013. As of February 2014[update], Lake is working with director Abby Epstein on a documentary about the dangers of hormonal birth control, titled Sweetening the Pill. The film is based on Holly Grigg-Spall's upcoming 2015 book titled Sweetening The Pill Or How We Became Hooked On Hormonal Birth Control. The film will explore the flurry of lawsuits related to these methods, as well as alternative options such as Natural Family Planning. Lake and Epstein said, "now [hormonal birth control is] making women sick and so our goal with this film is to wake women up to the unexposed side effects of these powerful medications and the unforeseen consequences of repressing women's natural cycles." On December 7, 2016, Lake made a cameo in the television musical Hairspray Live! On February 11, 2017, Lake appeared as a guest judge on the British talent show Let It Shine with Gary Barlow, Dannii Minogue, and Martin Kemp on the BBC. On February 17, 2018, Lake appeared on the British television show Through the Keyhole hosted by Keith Lemon. In March 2018 at SXSW, Lake and Epstein premiered their documentary film Weed the People, examining the use of cannabis as medicine and its status as a Schedule I prohibited drug in the United States. The film focused in particular on the use of cannabis in the treatment of pediatric cancer. On February 6, 2019, she was revealed to be The Raven in the Fox series The Masked Singer. She performed "Rainbow" by Kesha, "Bad Romance" by Lady Gaga and "Brave" by Sara Bareilles. 6 Quickstep/"Luck Be a Lady"
8 Waltz/"You Make Me Feel"
Semi-finals Samba/"Jump in the Line"
Lake is also known for her public struggle with weight. She admitted in 2011 that insecurity caused by abuse during her childhood had caused her to become a heavy eater. By the time of her role in Hairspray, she had gotten to 260 pounds on a 5'3" frame. In the early 1990s, just before her talk show premiered, Lake went on a diet and lost 100 pounds in just six months. During her pregnancy with her children, she admitted to being a yo-yo dieter but after the birth of her second son, she embarked on a healthier diet and soon lost another 30 pounds which she said got a lot more attention than her initial weight loss of 100 pounds. She has since maintained her weight for almost 20 years. Lake met illustrator Rob Sussman in October 1993, on Halloween. The couple married in Las Vegas on March 26, 1994. They have two sons: Milo Sebastian Sussman (b. March 22, 1997), and Owen Tyler Sussman (b. June 18, 2001), whose actual water birth was shown in The Business of Being Born, which Lake also produced. The couple filed for divorce in August 2003; it was finalized on February 25, 2005. Lake began dating jewelry designer Christian Evans in the summer of 2009. They became engaged in August 2011, and married on April 8, 2012. On 29 October 2014, Lake filed for divorce from Evans, citing "irreconcilable differences". In December 2014, however, they announced they had put their divorce on hold; it was finalized in 2015. Christian Evans died on February 11, 2017. On September 18, 2010, Lake's rented Malibu home was destroyed by a fire. She and her sons escaped without injury. On January 15, 2011, Lake finished in sixth place in the PokerStars Caribbean Adventure Luxury Ladies Poker Event, collecting $5,587 of the prize pool. 1987 Kate & Allie Teri Episode: "Send Me No Flowers"
1988 ABC Afterschool Special Carmen Episode: "A Family Again"
1991 Riders in the Sky Broadway Baby Episode: "Horsenapped"
2004 Higglytown Heroes Carpenter Hero (Voice) Episode: "Soup with Stars/The Happy Friendly Sparkly Toast Club"
2006 King of the Hill Lila (Voice) Episode: "Hank's Bully"
2010 Drop Dead Diva Susan Semler Episode: "Back from the Dead"
2010 The Oprah Winfrey Show Herself Guest, "Talk Show Reunion"
2016 Crazy Ex-Girlfriend Dream Ghost Episode: "Josh Has No Idea Where I Am!" 2018 Drop the Mic Herself Episode: "Shaquille O'Neal vs. Ken Jeong / Jerry Springer vs. Ricki Lake"
1 2 "Ricki Lake Biography (1968-)". FilmReference.com. ↑ "Shopping In Syndication Hell". Newsweek. February 5, 1995. Retrieved 2010-03-03. ↑ Zoglin, Richard (January 30, 1995). "Talking Trash". Time. Retrieved 2010-03-03. ↑ Corliss, Richard (February 29, 1988). "Cinema: Buxom Belles in Baltimore 'Hairspray'". Time. Retrieved 2010-03-03. ↑ Willstein, Paul. "It's a Wrap for 'Hairspray'". The Morning Call (Allentown, Pennsylvania). July 26, 1987. ↑ Werts, Diane (December 6, 1993). "Respect earns Ricki Lake success on TV". Baltimore Sun. Retrieved 2010-10-30. ↑ Cagle, Jess (December 30, 1994). "Entertainer 8: Ricki Lake". Entertainment Weekly. Retrieved 2010-12-07. ↑ Ikenberg, Tamara (February 28, 1999). "Gen-X Cinderella has the knack". Baltimore Sun. Retrieved 2012-04-11. 1 2 Albiniak, Paige (April 20, 2011). "EXCLUSIVE: Ricki Lake Returning to Daytime". Broadcasting & Cable. ↑ Bonawitz, Amy (June 15, 2006). "Ricki Lake Is Back In The Game". CBS News. Retrieved 2009-05-15. ↑ "The Business of Being Born (2008) – Movie Details". Yahoo! Movies. ↑ "Ricki Lake's The Business of Being Born to Be Released in October". Variety. MovieWeb.com. August 29, 2007. Archived from the original on 2007-09-01. 1 2 "Benefit Screening: The Business of Being Born". Archived from the original on October 11, 2007. ↑ "Ricki Lake: Ricki Lake On The Business Of Being Born". The Huffington Post. April 17, 2007. ↑ "Your Best Birth". Hachette Book Group. Archived from the original on 2009-04-22. ↑ "Ricki Lake Is the New Headmistress of VH1's Third Installment of Charm School". VH1 Press Release. Futon Critic. February 5, 2009. ↑ "VH1's Charm School with Ricki Lake". VH1.com. ↑ "Donahue, Sally, Geraldo, Montel, Ricki: Talk Show Hosts Together For The First Time". Oprah.com. November 8, 2010. ↑ Albiniak, Paige (March 14, 2011). "EXCLUSIVE: Ricki Lake Poised for a 2012 Comeback". Broadcasting & Cable. ↑ "Ricki Lake's talk show cancelled". WENN.com. Newshub. Retrieved February 6, 2013. ↑ "The 40th Annual Daytime Entertainment Emmy Award Winners". National Academy of Television Arts and Sciences. June 16, 2013. Archived from the original (PDF) on June 28, 2013. Retrieved June 17, 2013. ↑ Yamato, Jen (February 12, 2014). "Ricki Lake, Abby Epstein Push 'Sweetening The Pill' Birth Control Doc". Retrieved March 10, 2014. ↑ Bianco, Robert. "Review: 'Hairspray' has plenty of luster as NBC's best live musical". USA Today. December 7, 2016. ↑ Littlejohn, Georgia. "Go Ricki, Go Ricki! Let It Shine fans rave about Ricki Lake’s ageless beauty as she makes a guest appearance as a judge on the talent show". The Sun. February 11, 2017. ↑ Wilstein, Matt (March 13, 2018). "I Got High With Ricki Lake and Talked About Pediatric Cancer". The Daily Beast. Retrieved March 24, 2018. ↑ Suarez, Olivia (March 14, 2018). "Medicinal pot documentary shares hopes for legalization at SXSW". KVUE. Retrieved March 24, 2018. ↑ O'Sullivan, Kelly (5 February 2019). "Everyone Thinks Gladys Knight Is the Bee on 'The Masked Singer'". Country Living. Retrieved 7 February 2019. ↑ "The Masked Singer: The Raven Performs Bad Romance". finance.yahoo.com. Retrieved 7 February 2019. ↑ Venable, Malcolm (6 February 2019). "The Masked Singer's Raven Was Exactly Who We Expected | TV Guide". TVGuide.com. Retrieved 7 February 2019. ↑ Castro, Peter (May 23, 1994). "Down the Alleys With...Ricki Lake". People. 41 (19). Retrieved 2009-05-14. ↑ Silverman, Stephen M. (2001). "Lake's Water Baby". People. Retrieved 2009-05-15. Note: Archived article erroneously dated August 22, 1997. ↑ "All Talked Out: After Nine Years of Marriage and Two Kids, Ricki Lake Separates from Her Husband". People. September 8, 2003. 1 2 McNeil, Liz (May 23, 2010). "Ricki Lake Has a New Boyfriend". People. ↑ Schwartz, Alison (August 11, 2011). "Ricki Lake Is Engaged". People. ↑ McNeil, Liz (April 10, 2012). "Ricki Lake Elopes". People. ↑ Finn, Natalie. "Ricki Lake Files for Divorce From Husband Christian Evans After 2 Years of Marriage". eonline.com. Retrieved 10 April 2016. ↑ Birkinbine, Julia. "Ricki Lake and Husband Christian Evans Postpone Divorce After He Says They'd "Never" Get Back Together". closerweekly.com. Retrieved 10 April 2016. ↑ "Ricki Lake's Ex-husband Dead". World Entertainment News Network (England). February 14, 2017. ↑ Jordan, Julie (March 1, 2017). "Ricki Lake Reveals Her Ex-Husband Committed Suicide Amid Battle with Bipolar Disorder". People.com. Retrieved 2019-02-07. ↑ "TV Star Ricki Lake's Malibu Rental Home Burns Down". CBS Los Angeles. Retrieved 2 February 2018. ↑ Sanger, David E. (January 15, 2011). "2011 PCA: Kristin Bihr wins Luxury Ladies Event". PokerStarsBlog.com. Archived from the original on January 19, 2011. Retrieved January 16, 2011. Wikimedia Commons has media related to Ricki Lake.